This morning's employment report for December showed a 312K increase in total nonfarm payrolls, which surprised forecasts.The unemployment rate jumped to 3.9%. The Investing.com consensus was for 178K new jobs and the unemployment rate to remain at 3.7%. 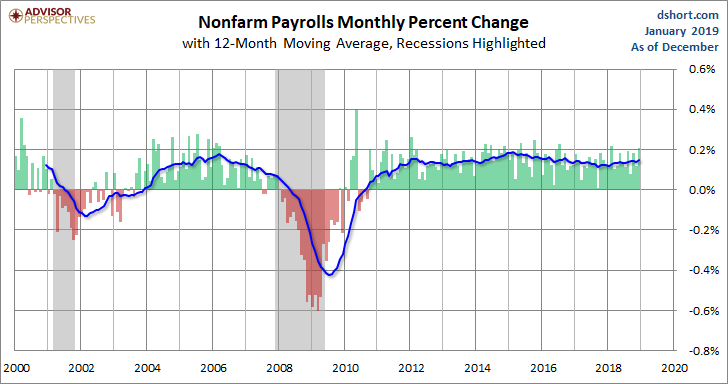 Total nonfarm payroll employment increased by 312,000 in December, and the unemployment rate rose to 3.9 percent, the U.S. Bureau of Labor Statistics reported today. Job gains occurred in health care, food services anddrinking places, construction, manufacturing, and retail trade. Here is a snapshot of the monthly percent change in Nonfarm Employment since 2000. We've added a 12-month moving average to highlight the long-term trend. The unemployment peak for the current cycle was 10.0% in October 2009. 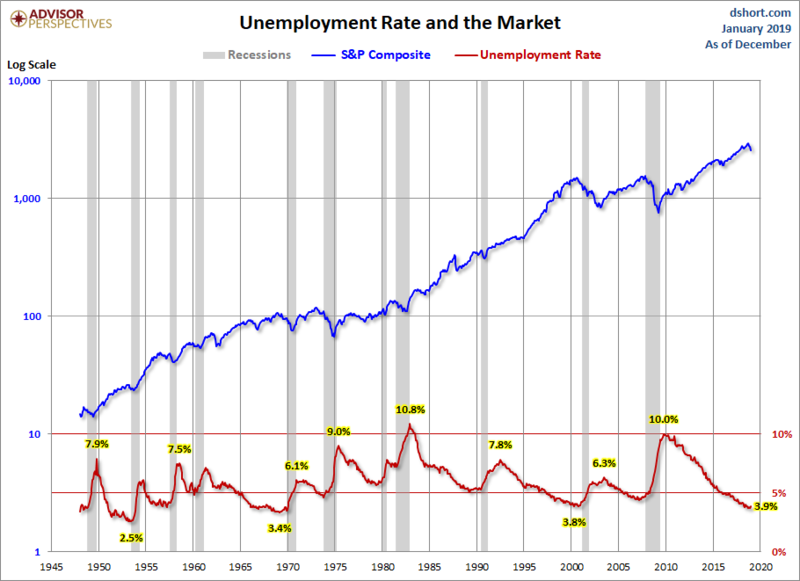 The chart here shows the pattern of unemployment, recessions and the S&P Composite since 1948. 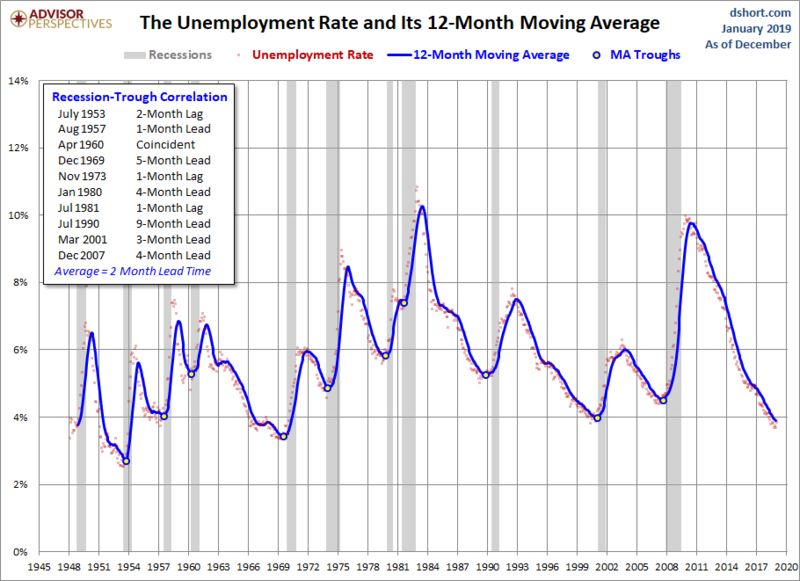 Unemployment is usually a lagging indicator that moves inversely with equity prices (top series in the chart). Note the increasing peaks in unemployment in 1971, 1975 and 1982. The mirror relationship appears to be repeating itself with the most recent and previous bear markets. 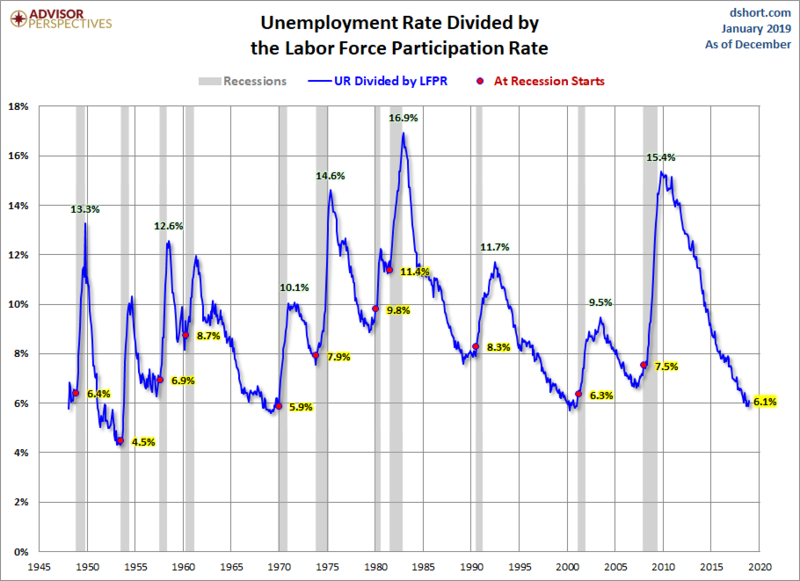 Now let's take a look at the unemployment rate as a recession indicator or more specifically the cyclical troughs in the UR as a recession indicator. The next chart features a 12-month moving average of the UR with the troughs highlighted. As the inset table shows, the correlation between the MA troughs and recession starts is remarkably close. We've added another chart to illustrate the reality of the unemployment rate - the unemployment rate divided by the labor force participation rate. The next chart shows the unemployment rate for the civilian population unemployed 27 weeks and over. This rate has fallen significantly since its 4.4% all-time peak in April 2010. It is now at 0.8%, unchanged from the previous month.